The annual human migration know as Chunyun is well underway. All across China, much of Asia and parts of the rest of the world, folks are returning home to celebrate Chinese New Year. The Ministry of Railways estimates that 340 million passengers will take trains during the 2009 Chunyun period. With the average daily capacity of the Chinese railway system pegged at 3.4 million, that leads to a huge shortage of tickets. Before it’s over, many passengers will have paid double or even triple-price for their tickets from scalpers or wait in lines for days at a time at railway stations. I went down to the Liuzhou railroad station yesterday and found these folks waiting to find out if they’ll get tickets in time to get to their hometowns for the New Year’s Eve reunion dinner. The problems associated with buying railway tickets are well publicized and difficult enough even during non-holiday periods. Apparently, the issue has become a full-blown crisis this year, in that President Hu Jintao decided to intervene with the Ministry of Railways in an attempt to bring some order and propriety to ticket sales. 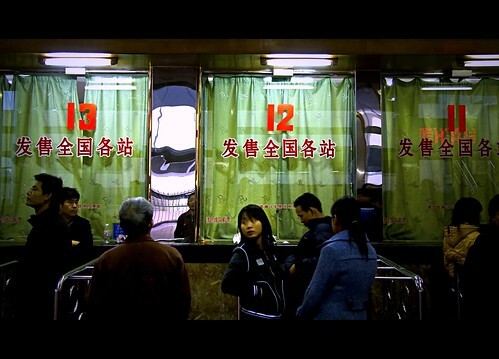 Most folks outside of China won’t understand or believe the process of buying a railroad ticket here. Advanced ticket sales of more than a few days are uncommon and purchasing a round-trip ticket is next to impossible. It seems everyone, including the government, knows that the problem is corruption, with railway officials, ticket sellers and scalpers colluding to buy up large blocks of tickets and resell them at higher prices. I have never purchased a railway ticket in China without having to “go through” someone to get it. but I’ve never had to pay more than face value either. The ticket purchasing fiasco creates a lot of frustration and ill will among the people and in the midst of the current economic downturn, the government is particularly sensitive, as unemployment continues to soar. I hope the President’s intervention works out better than some of the other edicts (plastic bags anyone?). Still, compared to last year, this year’s Chunyun has been a breeze. During Spring Festival 2008, the country was in the grips of the worst winter in 50 years. Severe snowstorms and frigid temperatures crippled the nation’s transportation system for days, disrupting travel plans for millions. In Guangzhou alone, as many as 900,000 people found themselves stranded. I should say thanks to everyone who dropped by with a note, after four days I think I have shaken off the worst of the flu and today actually feel somewhat human. The weather here in Liuzhou has made a return to more “winter-like” temperatures. The last couple of days in the low 40’s and cloudy and moist. Everything feels damp and it will get worse before it get’s better. On my walk home from the train station I continued to look for an Asian mannequin. Nothing yet, but I am told they do indeed exist. Silver Boy here was in the window of a sporting goods store. Two more days until Chinese New Year! I’ll have dinner with some friend’s in their home and hopefully get out to take some photos of revelers enjoying the fireworks. I hope it warms up a little before then. ~ by Expatriate Games on January 24, 2009.